You are here: Home / Expired / Nonni’s Biscotti Bites Giveaway! Nonni’s Almond Dark Chocolate Biscotti Bites – The original delicious treat full of real almond pieces and dipped into semi-sweet dark chocolate. Nonni’s Double Chocolate Salted Caramel Biscotti Bites – A joyous indulgence loaded with caramel bits, dipped and drizzled in rich milk chocolate then finished with a sprinkle of sea salt. Nonni’s Very Berry Almond Biscotti Bites – A decadent bite brimming with fresh nuts, sweet berries and dipped in creamy Greek yogurt. 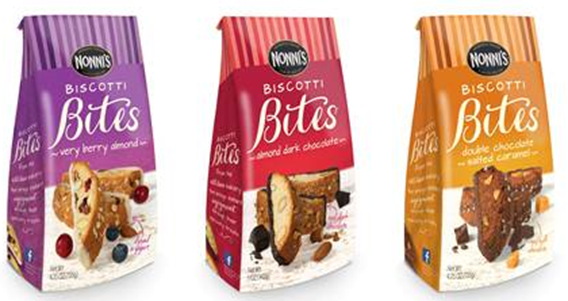 Nonni’s, creator of the number one selling biscotti, recently introduced two new scrumptious treats –Double Chocolate Salted Caramel and Very Berry Almond Biscotti Bites. The new bite-sized creations maintain Nonni’s devotion to use only the highest-quality ingredients, including real almond pieces, dark chocolate drizzles, luscious caramel bits, sweet cranberries and creamy Greek yogurt. Nonni’s Biscotti Bites are less than 40 calories per cookie, making them a smart and sweet snacking solution. Nonni’s Biscotti is hosting a series of giveaways on their social pages. The “Who’s on top?” giveaway will begin July 14, where fans can help Nonni’s decide which of Nonni’s three Biscotti Bites flavors is the most favored, for the chance to win free product! They are allowing me to give 1 lucky winner a set of all three delicious flavors! Mandatory entry: Just leave a comment telling me which one you’re most excited to try. This giveaway will end Saturday, July 26th, 2014 at 11:59 pm Central time and the winner will be emailed soon thereafter. Make sure you add [email protected] to your address book, so you get the email if you win! I did number 1 2 4 5 6. I would love to try the Almond Dark Chocolate. Double Chocolate Salted Caramel would be my favorite ! Already Like Grocery Shop For FREE on Facebook and already receive Dian’s Daily Deals by e-mail. And I am following Grocery Shop For FREE on Pinterest.